Did you know that it was at Bletchley Park in Buckinghamshire, U.K. that the future course of World War II was largely determined? With the creation of the world’s first computer, the best brains in Britain fought against huge odds to read encrypted enemy signals. Their success is said to have reduced the length of the war by an estimated two years. Now, our friends and partners at British publisher Puzzler Media would like to invite you to celebrate the Centenary of the Crossword and find out just how crossword puzzles helped the allied forces win World War II! Free time to meet the veterans of Bletchley and for a bit of fun, perhaps try your hand at decoding some puzzles! Tickets are £65 per person. There are 80 tickets available and these will be allocated on a first-come, first-served basis with a maximum of 4 tickets per household. 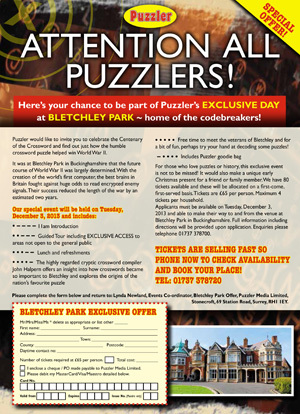 Applicants must be available on Tuesday, December 3, 2013 and able to make their way to and from the venue at Bletchley Park in Buckinghamshire. Full information including directions will be provided upon application.